BizSpark is arguably one of the best deals on the internet for startups. 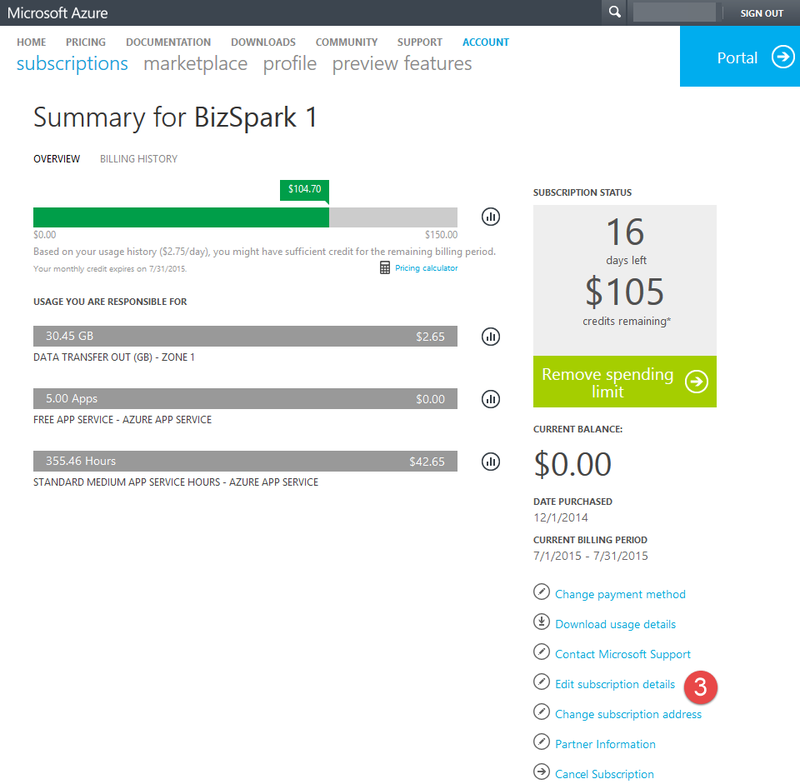 For me the key benefit that it brings is the 5 x $150 per month of free Azure credits. That said they are a little bit tricky to claim. The first thing you need to do is claim all you BizSpark accounts and then from each of those accounts claim your Azure credits. This blog post describes this process, so start by doing that. 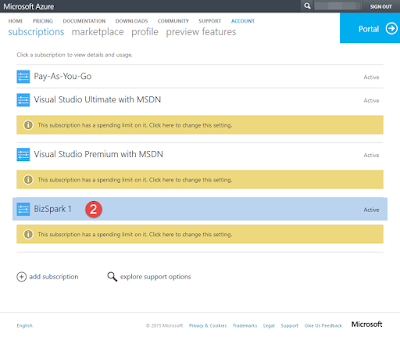 So after doing this you have 5 separate Azure accounts each with $150 per month of usage. However what we want is one Azure account where we can see services from all of these subscriptions at once and that requires a couple of more hoops to jump through. 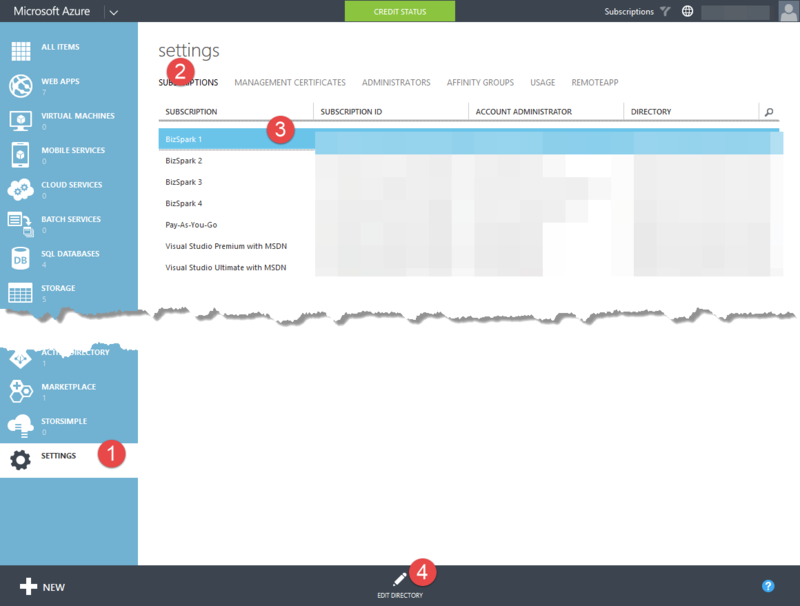 In the end you will end up with one account where you can see and create services from all 5 subscriptions without having to log in and out the Azure management portal to switch between them. The first step is to pick the one account you want to use to administrate all the other accounts. This is a bit counter intuitive, but you need to start by adding every other account as co administrators to the account from the first step. Yes, I am saying this correctly. All the other accounts need to be added as administrators to the main admin account (Don't worry, this is temporary). The following steps need to be done for each of the accounts except for the main account from step 1. Log into the management console using one of the four auxiliary accounts and go to settings. Make sure you are on the subscription tab. Select the subscription that belongs to the account you are currently logged into. It will be the one that has the account administrator set to the account you are currently logged into. If you have done this correct you should see two different subscriptions, one for the subscription you are logged in as and one from the account in step 1. Click the Edit Directory button at the bottom. In the image below make sure you select the directory of the main account from step 1. It shouldn't be hard because it will be the only account in the list and pre-selected. If you have already set up any co administrators to the account you will be warned that they will all be removed. Add the account from step 1 as co administrator to this account as described in the linked to article at the top of the post. The last step is optional but all the subscriptions will be called Bizspark and hard to keep apart so you might want to rename them. 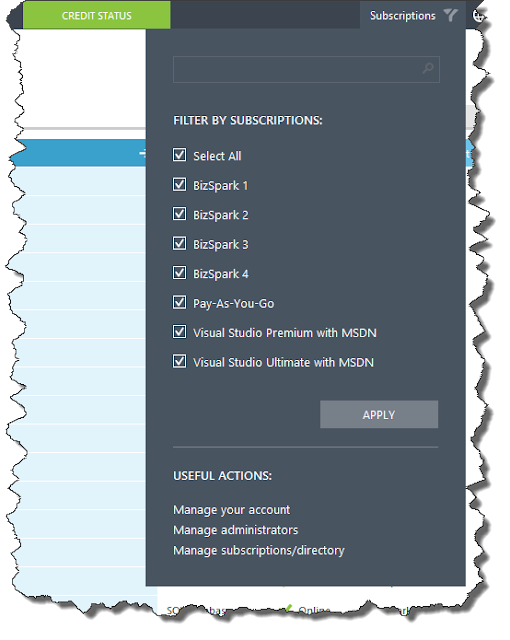 To do this go to the Azure account portal at https://account.windowsazure.com/Subscriptions. This page tend to be very slow, so be patient following links. Click on the subscription name. Your screen might look different depending on how many subscriptions you have. Click on the Edit Subscription Details. Enter the new name in the dialog presented. 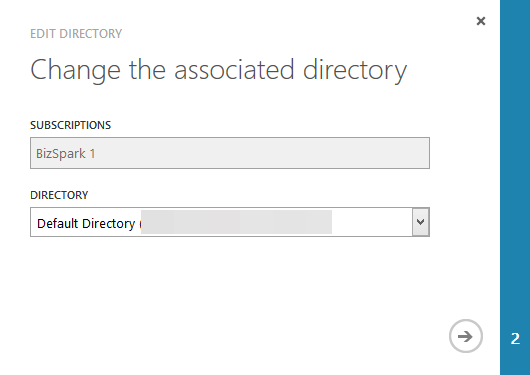 You can also optionally change the administrator to the account from step 1 at the top, this will remove the owning account as an administrator from the account all together (Although they are still responsible for billing). You can now remove all the other accounts from being administrators to the main account that you added in step 2 if you want. 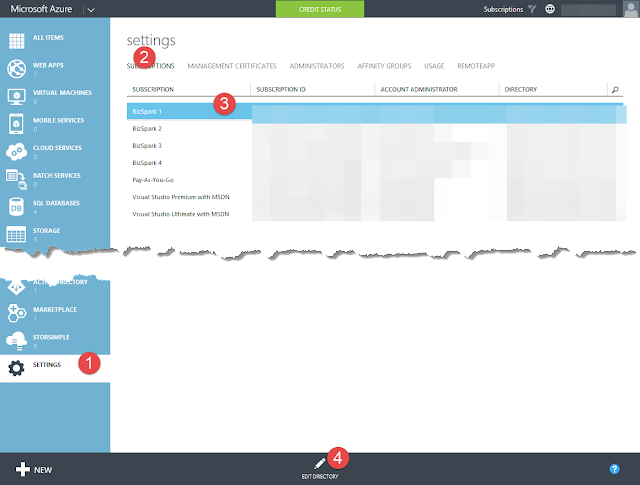 If you follow all these steps when you log into the account from step 1 you should be able to see all of your subscriptions at the same time in the Azure management console like in the screenshot below. Keep in mind this does not mean that you have $750 to spend as you want. Each subscription still has a separate limit of $150 and you have to puzzle together your services as you create them to keep all of the 5 limits from running out but at least this way you have a much better overview of what services you have provisioned in one place.